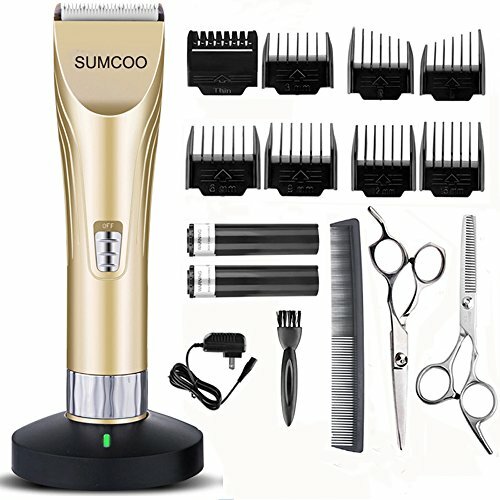 This new professional wireless hair clipper set will provide you and your family with excellent cutting experience, it’s very useful both in home and profession salon use! With the small and delicate clipper body, your kids also can join with you to give hair cuts to all family members.No more expensive bills for hair cutting and you can do it in an easy way. 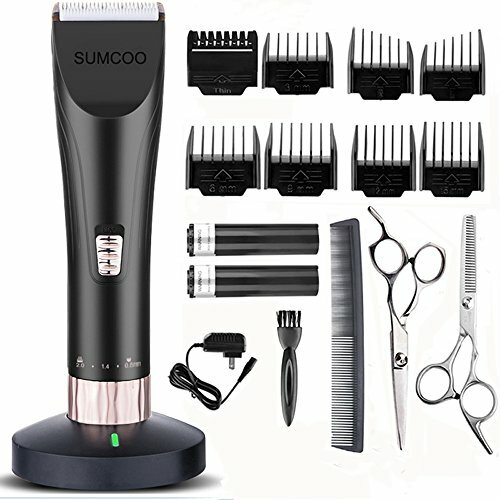 Accessories: 3mm,6mm,9mm,12mm,15mm,thin comb,left angle comb, and right angle comb guides,grooming comb, grooming scissors,adapter,battery. 1.Due to the shipping restrictions,oil accessories not include in grooming clipper. 2.Please do not disassemble the product by yourself. 3.Our clipper can only be allowed to clean by cloth with a little water or mild soap liquid. 1.Our hair clippers With R shaped rounded edge design of the blade prevents from accidentally hurting skin and with 3.7V precision motor, give you a safety sharp. 2. Titanium blade combining with the ceramic movable blade for efficient and long term cutting. The titanium blade of the kids clippers will not get rusty. It always keeps sharp and ensures high durability. 3. Our kids and baby hair clippers provide3-6-9-12-15MM, thin, left angle, and right angle guide combs. Now you can easily adjust the combs to the proper height and type . With leveled combs, you can easily trim hair perfectly even. 4. With low vibration and ultra quiet design, our hair trimmer let you free it from work noise with only about 50 db, to help kids and babies feel at ease, not afraid hair cut any more. 5.Note: Due to the shipping restrictions,oil accessories not include in kids grooming clippers.Please do not disassemble the product by yourself. And our clipper can only be allowed to clean by cloth with a little water or mild soap liquid. 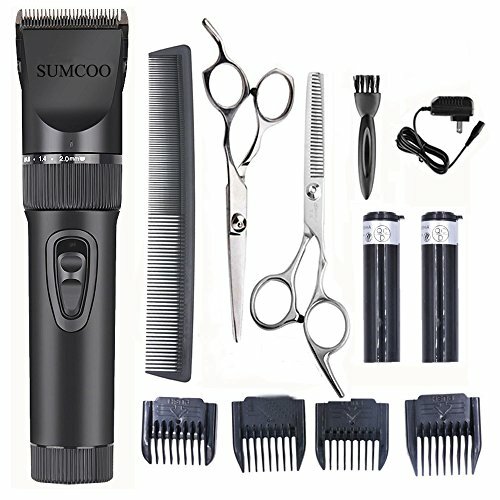 Accessories: 3mm,6mm,9mm,12mm comb guides,grooming comb, grooming scissors,adapter,battery. 1.Our hair clippers With 2000mAh Lithium Battery, charge one time can use last one year, at the condition of each month use one time and each time use 15 minutes. 2. Black titanium blade combining with the ceramic movable blade for efficient and long term cutting. The titanium blade of the kids clippers will not get rusty. It always keeps sharp and ensures high durability. 3. Our kids and baby hair clippers provide3-6-9-12MM, guide combs. Now you can easily adjust the combs to the proper height and type . With leveled combs, you can easily trim hair perfectly even. 4. With Q-SUS Muffler Technology and ultra quiet design, our hair trimmer let you free it from work noise with only about 60 db, to help kids and babies feel at ease, not afraid hair cut any more.